Do You Want To Give An Exclusive Experience To Your Guests At A Party OR Special Occasion? Want To Amuse Your Children With Something Different Than Usual? Want To Enjoy The Starry Night With Your Partner? Here Is A Wonderful Device That Can Provide This Exclusive Experience To Everybody. Light Device For A Wonderful Experience – This night light is a perfect mood refresher for all ages; an amusement for children, romantic feeling for your partner and a great experience for your family and friends at any party, occasion, or event. Suitable For Any Celebration Events - This night light device produces a relaxing and soothing atmosphere. It is ideal for weddings, birthday parties, and festive celebrations or any other occasion. Indoor Starry Night - This projector creates a galaxy rainbow of stars on your ceiling. It fills the room’s ceiling full of stars to create a soothing sleep environment. Also, it can be illuminated for a calming nightlight effect. It is best suited for homes, bedrooms and children rooms, etc. Promotes Sleep - Get closer to the moon and stars. Give your child a good sound sleep with this night light. It is exclusively best for a kid's room. Portable Device Powered By Battery Or USB - This night light device is powered by 4*AAA batteries (NOT INCLUDED) or USB cable. Plug in the device from your computer or power bank, and you can use it anywhere. ✓INDOOR SKY - This Starry Sky Night Light is the outcome of an innovative design that brings a perfect sky-like environment to your home. 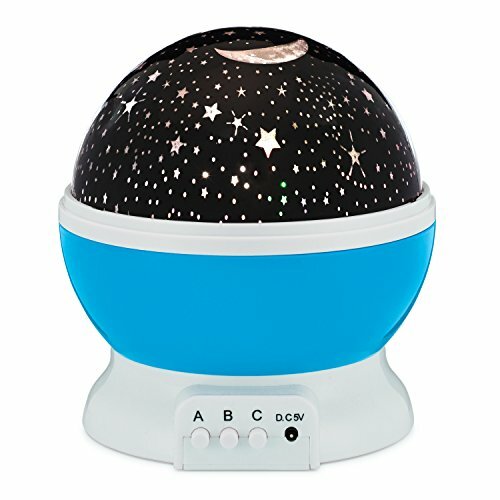 This device creates a starry sky in your children's bedroom. It will help to refresh your children's mood and get them a good night's sleep. It is not limited to only children's amusement; anybody can fall in love with the amazing starry sky experience that this light creates. ✓EXCEPTIONAL INDOOR EVENT EXPERIENCE - This device can act as a fast mood refresher for anybody on any occasion. This device can create a decorative environment for any kind of celebration or event. Use this device for all occasions such as weddings, birthdays, and festive parties. Use it to decorate the night, creating a special and romantic atmosphere in your bedroom or for any other indoor party occasion. ✓STAR PROJECTOR -- The stars are displayed on a bedroom ceiling or wall or any indoor hall by the projection of lights. The starry projection is an unforgettable experience for anyone. There are 4 color light options: blue, yellow, red, and green; choose either a single color of warm yellow or multiple colors at one time. ✓EASY OPERATION AND FLEXIBLE USE - This is the newest generation light set with 4 LED beads of warm light, blue light, green light, and red. There are 3 buttons to operate the device and they are used for turning on or off the hard-light mode, light color conversion, and light rotation. The device has a removable white dome; when removed, it can be used as a projection night light. This cover is very handy when you want just a plain light to glow in the room. ✓100% RISK-FREE PURCHASE - Providing you with the friendliest customer service is our number one goal. This star projector comes with a risk-free One Year Guarantee. Get a free replacement if your light device stops working within one year. If you have any questions about this product by Bananas Over Baby, contact us by completing and submitting the form below. If you are looking for a specif part number, please include it with your message.